The FleetPC-8 Car-PC series offers high performance and maximum connectivity. 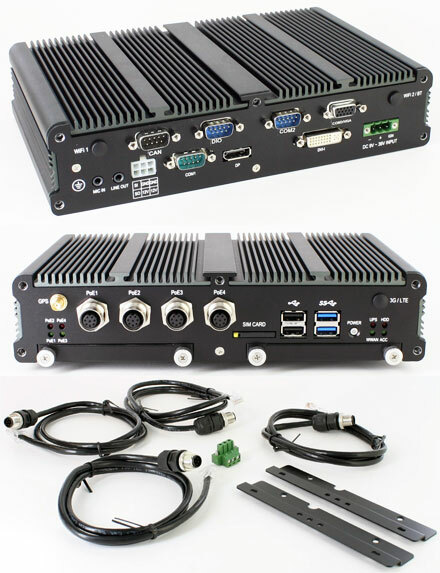 The 4x LAN (POE+) ports and dual hot-swappable 2.5" drive bays (RAID 0/1 support) and internal SATA DOM module connector, the system is for example perfect for digital IP video recording applications (police, etc.). CAN-BUS, 4x RS232/485, 4x digital In/Out and 2xUSB3.0 allow maximum connectivity. DVI, VGA and DisplayPort connectors allow the connection of a variety of displays (support dual independent display). The DVI port also can be connected to CarTFT-CTF displays with an All-in-one cable (VGA/USB/audio/power). Extensive setup and programming options and Watchdog-ability, optional backup battery kit, wide input range (9-36V), extended temperature range (-40° to 70° C) and vibration-/schock-/eMark-certification complete the offer and make the FleetPC-8 series the ultimate platform for any mobile application need. The PC is completely fanless and is equipped with an Intel Core i7-4650U 2x1.7Ghz CPU and 4GB RAM (upgradeable up to 16GB).